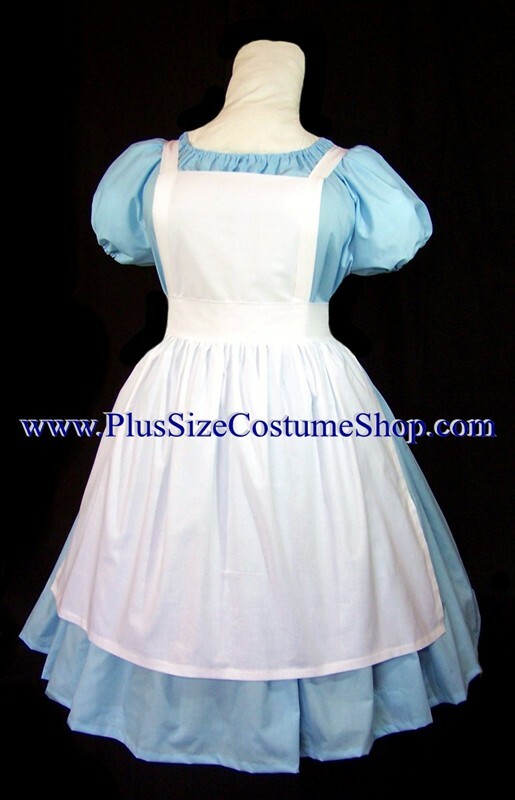 Plus Size Costume Shop carries a full line of professionally hand-made Halloween costumes, Renaissance garb, bridal gowns, Christmas costumes and historical clothing in sizes 1X (18/20W), 2X (22/24W), 3X (26/28W), 4X (30/32W), 5X (34/36W), 6X (38/40W), 7X (42/44W), and 8X (46/48W). The peasant shirt is short-sleeved and made of light blue cotton. It has elastic in the neckline and sleeves for a comfortable fit. The skirt is also made of light blue cotton. The skirt has an elastic waist for comfort. The skirt will be hemmed at 28" in length (approximately mid-calf on someone of average height) unless a specific shorter length is requested. There is an attached white net slip underneath the skirt. The apron is made of white cotton. The bib tucks into the back of the skirt and the apron ties around the waist. This costume can be made in your choice of colors!